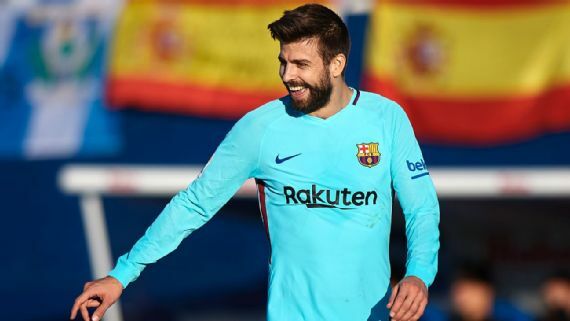 Barcelona have lost an appeal to overturn Gerard Pique’s booking against Leganes, which means the defender will miss Sunday’s top-of-the-table La Liga clash against Valencia. The Royal Spanish Football Federation’s competition committee reviewed video footage from the Catalan club and decided to stick with the original ruling made by referee Udiano Mallenco. Pique was booked for grappling with Nordin Amrabat and Barca coach, Ernesto Valverde, said after their 3-0 win, that he felt the decision was “excessive” and could quite easily have gone the other way. However, striker Luis Suarez has had his yellow card from the same game revoked, after the competition committee agreed that his tangle with goalkeeper Ivan Cuellar was not worthy of a booking. With Javier Mascherano also missing for the game at Mestalla, Valverde is left with just Samuel Umtiti and Thomas Vermaelen as his only available central defenders.